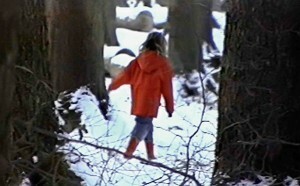 A little girl walks in the woods. It seems lost between big trees. But these trees are not overpowering; they make the girl feel protected. A magical light surrounds the girl, leads it safely through the darkness. All the works of Sonja Wyss have to do with the feeling of innocence and loneliness, in which we find to ourselves. Sonja Wyss confronts us with the question, which position we take. Are we the ones, who grew up and left childhood behind, lost our innocence and observe the innocence of this little girl? Are we the observers, who look back into their own childhood, into a time, when we were innocent and naiv? Are we longing to reach back into that time, when we lived in a child’s dreamworld? The girl in this picture is enclosed in it’s own world. It seems nothing to know about danger and does not know that it is observed by us. The picture is printed with pigments on ‘Büttenpapier’. The quality of the still lies in the intensity of the colors in every detail. If you look at it closely you will see an interesting surface, that remind us of abstract paintings. Please Email for information, price, availability and delivery options.